1 Cook potatoes in their peels about 20 minutes. Drain, rinse, peel and coarsely chop. Let cool, then cook golden brown in a pan with the butter, season with salt and pepper and set aside. 2 Cut the bread into bite-size cubes. 3 Season shrimp with salt, pepper and lemon juice. 4 Cut cheese small and warm with the wine in the fondue pot on the stove while stirring and allow to melt. 5 Mix the cornstarch with a little water until smooth and add with the caraway to the cheese. Boil and simmer for some time until everything is blended. Stir the dill into the cheese and season to taste, then keep the chafing dish hot. 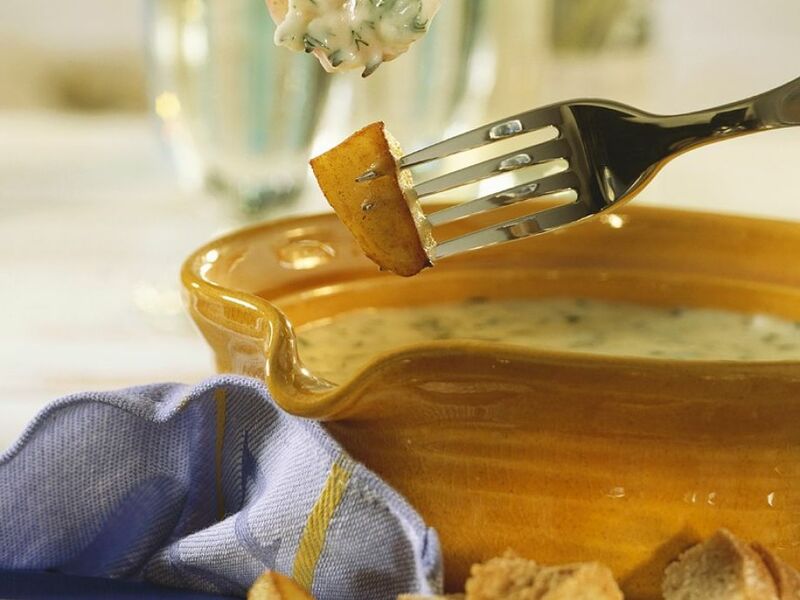 6 To serve, arrange potatoes, bread and shrimp on plates and draw with fondue forks through the cheese.